Photo by Ralph Dieter Pictured from left are Ed, Matthew, Maureen and Nick Delamater. On Saturday afternoon, April 1, there was an Eagle Scout Court of Honor held at the Bedford Presbyterian Church. The ceremony was held at 3 p.m. in the sanctuary of the Bedford Presbyterian Church to present the award of Eagle Scout to Matthew Delamater. Matt is Eagle number 106 in Troop 414. More than 60 people braved the snowstorm and came out while it was still snowing. The Eagle Scout Oath was administered by Scoutmaster Ronald Carvalho. The presentation of the Eagle Badge and Charge to the Eagle was done by Asst. SM Stephen Carter. State Representative David Danielson read a congratulatory proclamation from the Speaker of the NH House of Representatives. After the ceremony there was a reception in Fellowship Hall. Matt joined Cub Scout Pack 5 in 2006 when his was in first grade. At first, he was uncertain whether scouting was for him, but he quickly fell in love with scouting. He made new friends who he is still friends with today and bonded with them at events like the Chuckwagon, the Blue and Gold dinners and his personal favorite, The Pinewood Derby. Matt also enjoyed Resident Camp and the other overnight trips like the Museum of Science in Boston and Battleship Cove. 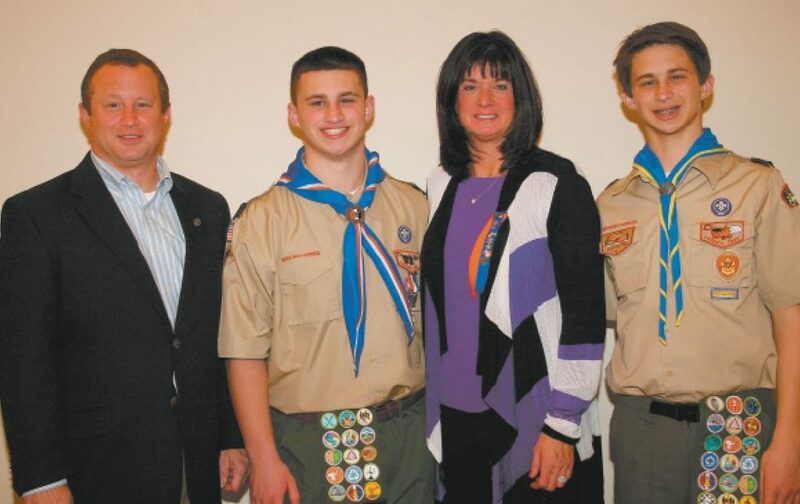 In 2011, Matt earned his Arrow of Light and crossed over into Bedford Troop 414. The other scouts in Troop 414 made the troop feel like a second home to him as there were many familiar faces. Matt had so much fun on the monthly campouts and the weekly meetings with the same scouts he had been with since first grade. Matt’s favorite part of Boy Scouts was the week-long summer camps where he made lots of memories on activities such as sailing, merit badges and just hanging out with friends. However, Boy Scouts is not just fun and games. Matt had to serve in numerous leadership roles and earn many merit badges to progress through the ranks. Over the years, he held the positions of assistant patrol leader, historian, patrol leader and troop guide. Matt would like to thank the adult leaders of Pack 5, Troop 414, the merit badge counselors and his family for helping him on the trail to Eagle. For my Eagle Scout project, I built a gaga pit for Camp Allen in Bedford, NH. Camp Allen is a residential summer camp for people with physical and developmental disabilities. A gaga pit is a wooden octagon court which is used to play a game similar to dodgeball. The pit I built was 432 cubic feet with a sliding wooden gate and mulch floor for wheelchair access. To fund the project, I held a bake sale at St. Elizabeth Seton Church in Bedford. Through the parishioners’ generosity, I raised over $1,200 which exceeded the cost of my project allowing me to donate the excess funds to Camp Allen. The first step in building was to cut wood at the proper lengths and at 45 degree angles so that the pieces would all fit. We ended up using 24 planks as well as 10 posts. The next step was to dig the holes at the site using a mechanical auger. This was the most challenging part of the building process as we ran into many large rocks that we were forced to dig out. We attached the planks to the posts to make the wall of the pit. The final piece was the sliding gate. We used rollers and partially buried a plank to give the gate something to slide on. The gaga pit will be there for many years and is one of the most enjoyable activities at the camp. I would like to thank Grove Rental for donating equipment, Liberty Hill Construction for consulting, my family, and the scouts and leaders of troop 414 for helping me. I would also like to thank Michael Constance, director of Camp Allen, for his guidance on the project.